However, when these units are disaggregated into multi-family rental apartments, the number of family-sized units become smaller with these units concentrated in older structures. The study also found that only around 12 percent of 3+ bedroom units are affordable to households earning below 80 percent of area median income (AMI), around $75,000 for a family of four. 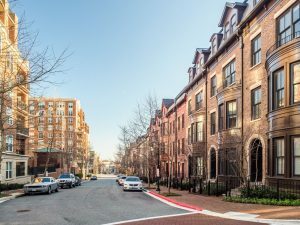 The Department of Housing and Community Affairs (DHCA) releases an annual Rental Facility Survey of all Montgomery County multifamily rental buildings that requires the facility manager to report on several characteristics, including unit sizes, rent levels, occupancy, facility age and structure type (i.e. garden, mid-rise or high-rise). 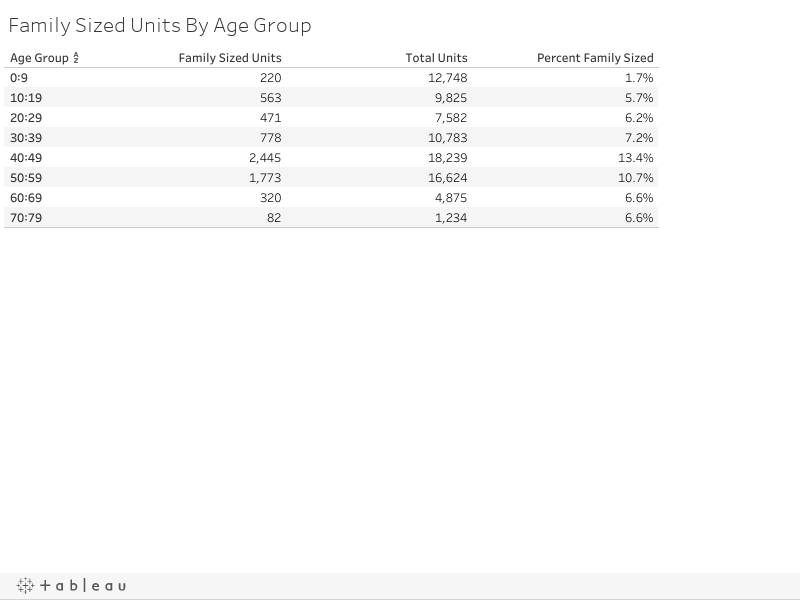 Through a sharing agreement with the Planning Department, DHCA graciously provided us with data for the chart below and mapping tool, which allows us to show the location and number of family-sized units by age group. The chart shows that the peak period for the construction of family-sized units was in the years 1967-1976 (40:49) at around 13 percent. Since then, the number of family-sized units brought online has declined in each subsequent period. This decline culminated in the past 10 years (0:9), when family-sized units from this period comprised only 1.7 percent of all such units. Of Montgomery County’s 82,350 units in rental facilities, with a minimum of 20 units, 6,665 were 3- or 4-bedroom units. This represents about 8 percent of the total rental stock. There are several policy implications that we can glean from this trend of disappearing family-sized units. Enacted in 1974 and implemented in 1976, Montgomery County’s moderately priced dwelling unit (MPDU) law requires at least 12.5 percent of any new development with 20 or more units be moderately priced for households earning less than 65 percent or 70 percent of AMI. The current law stipulates that the mix of MPDU units should be similar to the bedroom and unit mix of the market-rate unit buildings – making it hard to produce family-sized income-restricted MPDUs when the market is not producing market rate 3 and 4-bedroom units. The central theme of the Rental Housing Study is balancing preservation and production. 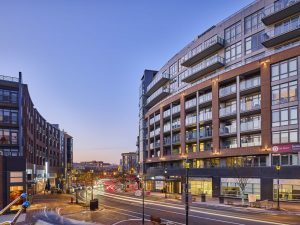 While it is important to produce new housing overall, especially because this creates new income-restricted MPDUs, it is also important to preserve existing affordable units when appropriate. Among the reasons for preservation is that our existing family-sized rental units are in older facilities, which are often at the risk of redevelopment as they age. Among the study’s 18 policy recommendations are two polices that could increase both the production and preservation of affordable family-sized units.  The first is changing how MPDUs are calculated to a square footage or floor area ratio (FAR)-based method, rather than based on a percentage of units. The FAR-based method allows the county to better target units of different sizes to meet different needs across the county. Recognizing that, in some parts of the county, the biggest need is for affordable, family-sized units, the FAR-based option incentivizes the development of units of sizes that meet needs in particular communities. The second recommendation is creating an inventory of at-risk properties with market-rate affordable units to prioritize their preservation. Having such a detailed inventory and ranking of existing naturally occurring affordable rental housing could help the county’s policies related to acquisition (e.g. right of first refusal) and could also guide planning and rezoning efforts undertaken as part of master plans.